A light, summery dessert for a lazy afternoon or after dinner. Best served in a garden - but failing that, eating these will make you feel like you are siting in one anyway. The madeleines are far and away best served warm from the oven. Melt the 60g of butter in a bowl over a pan of boiling water. Once melted, take the bowl off the water and let the butter come to room temperature. Whisk together the sugar and eggs until thick. Work in the lemon and vanilla; then siftin the flour, baking powder and salt. Combine thoroughly but gently. Lastly, stir in the melted butter and elderflower cordial. Leave the mixture to rest for at least 2 hours. If your kitchen is warm then put it into the fridge. Preheat the oven to 180C. Melt the remaining small piece of butter. Brush each madeleine tin indent with the butter, and follow up by dusting over the 1tbsp flour. Spoon in the madeleine mixture, going not quite up to the rim. Sit the tray on a baking sheet in the oven to help protect the fluted underside from getting too baked. Bake for 15 mins but check at 12. The edges should be going nicely brown. Let them sit for a minute out of the oven before lifting your madeleines out of the tin and onto a wire rack. Dust with icing sugar. 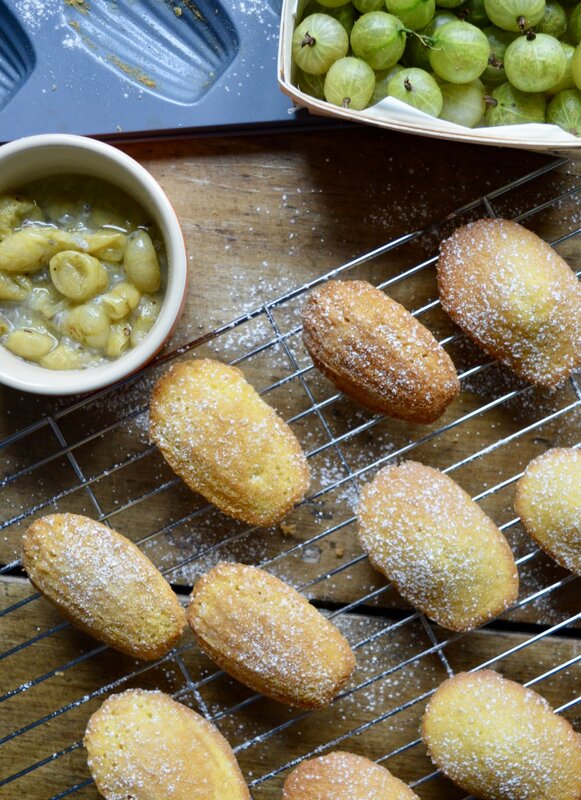 Serve the madeleines while still warm with the poached gooseberries alongside. Top and tail the gooseberries - pull off the stalk at one end and the brown tuft at the other. Put into a pan with the gin and caster sugar. Cover and cook over a high heat for 5 mins or until the gooseberries just start to burst and breakdown.